Fixed deposits have traditionally been one of the most popular investment options because they guarantee you good returns. Moreover, you are also able to ensure that your savings are safe throughout the tenure of these deposits. The interest rate on these deposits is also a lot higher than your regular savings accounts. You can use the FD Calculator to know more about the interest you are going to get on the deposit from a particular bank. It helps you make a wise decision when you have to choose between fixed deposit options from several banks. But the interest you get cannot be the only factor you bear in mind when investing in fixed deposits. There are several considerations that have to be taken into account to ensure that you get the most out of this stable and lucrative investment option. ● You have to realize fixed deposits up to Rs. 1 lakh are backed by deposit insurance. Hence it’s a good idea to have a few FDs with principal up to Rs. 1 lakh rather than have a lump sum amount into one FD. ● One worry many investors have is that they might lock their investments on what could be lower interest rates for long durations. To combat that, you can firstly use the FD Calculator to make sure you are making the best possible choice. You can then divide your investments into smaller amounts that can be invested in FDs of varying tenures. ● When you lock in an FD you are better off choosing one that compounds the interest in a shorter time span. Usually quarterly compounding interest FDs should be given precedence. ● It’s also important to remember that senior citizens get slightly higher interest rates on FDs for the same amount of time. ● There are many different financial institutions and cooperative societies that offer fixed deposit schemes along with reputed banks in the country. It makes it imperative to know more about the organization you are going to invest in and its credibility, as well. It will ensure that you are making a safe and sound investment decision with your hard earned money. 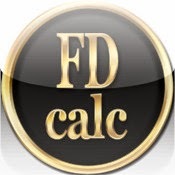 ● FD Calculator is a smart, simple and convenient option for you to pick the best fixed deposit option available in the market today. Choosing between hundreds of fixed deposit schemes from various banks and financial institutions can seem daunting. That’s the reason several consumers opt for the first fixed deposit option that comes their way. It can be a decision that costs you dearly, especially since there’s no reason for it when you have these calculators to rely on. ● There are fixed deposit options that can bring you tax saving benefits at the end of the year. Deposits of up to Rs. 1 lakh kept for a period of over five years can bring you substantial tax saving benefits. Hence if that’s one of the aims behind your investments then it makes sense to opt for these FDs. FD Calculator can give you a fair idea about interest rates, but there are few other factors that you have to think about when investing in FDs.